For people who don't visit art museums very often exhibition halls are seen as silent places filled with paintings, sculptures or other static art works. However, with the emergence of new technology and new forms of media, art museums are no longer quiet solemn places. Now, one might find noisy moving machinery, as well as musical sounds being played or moving digital images being projected on a wall in order to tell a story or speak to visitors. In some cases, new media has turned art museums into something more akin to the laboratory of a mad scientist. In an era where everyone is surrounded by cell phones, laptops, the Internet, social media and the continuous output of the latest technologies, the topic of new media may seem no longer exciting for many. Yet, there are many who still ask: What exactly is new media art? Started on Tuesday and scheduled to run until July 7, Thingworld: International Triennial of New Media Art is one of the biggest exhibitions the National Art Museum of China (NAMOC) will have this year. Exhibition curator Zhang Ga, who has lived and studied in Berlin and New York, is famous for his research in the field of new media art. In 2008, Zhang and NAMOC organized a new media art exhibition, Synthetic Times: Media Art China, discussing the relationship between humans and machines as part of that year's Olympic Cultural Project. Three years later, the project officially became a regular triennial event with that year's TransLife: Media Art China, dedicating itself to presenting what is happening in the world of global new media art. This year's exhibition is divided into three parts: Monologue - Ding an Sich, the title for which comes from German philosopher Immanuel Kant's famous concept of the unknowable "thing-in-itself"; Dialogue - Ding to Thing; and Ensemble - Parliament of Things. "The world is a thing world. For without things there would be nothing to describe, to interpret, to comment on, there would be no evocative signifiers that trigger imagination, conjure up representation, neither would there be societies nor cultures," Zhang wrote in the introduction to the exhibition. Fan Di'an, the curator of NAMOC, explained at a press conference for the event that he feels the topic of how we should view things other than human beings has always been an interesting point of discussion in human history. At different times people have had different understandings of this concept and now that new media has arrived it is able to present "things" as having more forms than we previously thought. "The exhibit gives hints about how to look at things, observe them and learn the order of the world so that we may come to respect the world," said Fan. This year, the exhibition has invited 65 artists from 22 countries to present 58 works. For most works, this is their first appearance in China. Ascension by Erwin Redl, an Austria born artist based in the US, is an installation work made up of a collection of plastic tubes with a ping-pong ball inside each one. Each pipe has a small fan at the bottom that propels the balls up at different times thereby creating different sequences. Redl told the Global Times that as individuals these pipes don't mean much, but once they start working together as a group they "achieve something much bigger than the individual." Redl finds that the lives of modern people have become heavily influenced by new media. "We have to find a balance between being on and off. As an artist, I am also trying to find a balance between this on and off," Redl said, adding that this is also why he started making low technology new media art works - pieces that don't use electricity. "A lot of artists use different strategies where you see the cable, the computer, or the monitor. I try to keep things invisible. I'm interested in how invisible structures influence things. That's how media influences the world we can touch." French artist Benjamin Gaulon, in cooperation with three other artists, presented their work ReFunct Media, a series of multimedia installations that reuse numerous abandoned electronic devices such as an old fan, a small TV and game machines. Many of the items used in the project were collected in China. "New media art is dirty new media I guess. It's a way for us to make a new world with old devices. It's liberating in a way," Gaulon told the Global Times. Gijs Gieskes from the Netherlands, another artist who participated in the Refunct project, explained the project saying, "It's kind of a communication among the machines. It's both an invention and an art work." He continued pointing out that when they first started it was a rough invention made up of a lot of small ideas. As each item was connected to each other to become a loop, none of them functioned the same as they did when alone. Thus, a new artwork exploring the possibilities of "obsolete" electronics was born. New media art has been a popular term over the past few years but few artists have managed to clearly define just what it is. 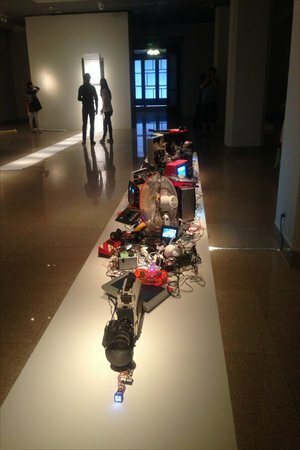 Involving technology or digital devices in some way seems to be a common characteristic of new media art. However, since digital technology develops extremely fast, what should be clarified as new media art is also constantly changing. In a 2008 interview with sohu.com, Zhang explained that new media is not really an entirely new phenomenon. Since the beginning, avant-garde art has always been closely related to the media that artists employ, which was usually the latest type of media at the time. For example, during the 1920s artists used wireless radio, which could be seen as a type of new media art for that time. Fan sees the "new" in "new media art" as much more than the use of technology. "More importantly, with the expansion of the language of new media, artists are able to rethink cultural issues from new perspectives." "How artists can use the power of technology to present their concerns about culture and society and create more potential for new media is a question for all artists. Curators should also be thinking about how to build a platform to broaden the public's horizons and allow them to understand the cutting-edge development of art," said Fan. Brazilian artist Rejane Cantoni told the Global Times that she finds new media art mainly deals with imagination and interaction. "Those two key words help this art communicate with the public. New media art is something art has developed to communicate complex ideas and share ideas in an easier way."